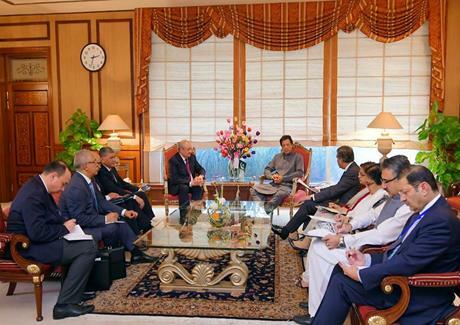 Prime Minister Imran Khan has expressed desire to increase bilateral economic cooperation with Uzbekistan. He was talking to Uzbek Foreign Minister Abdulaziz Kamilov who along with a delegation called on him in Islamabad today. The delegation conveyed the felicitations of President Shavkat Mirziyoyev on his election as the Prime Minister. The Uzbek Foreign Minister also communicated his President's proposal for railway connectivity between Pakistan, Afghanistan and Uzbekistan. The Prime Minister assured full support of his government to Uzbek President Mirziyoyev's efforts in achieving lasting peace and stability in the region and beyond. He also extended an invitation for President Mirziyoyev to visit Pakistan at his earliest convenience.